Home > Solar Panels > How Do Solar Panels Work? As you already know, solar panels turn sunshine into electricity. There's some clever technology that goes into making panels work and this guide you'll learn how they are assembled; from cell to module. 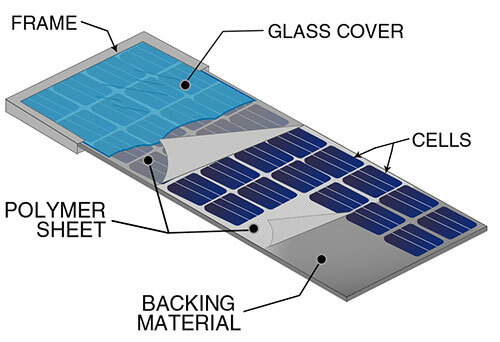 The basic building block of a solar module is the solar cell, which converts sunlight into electricity by harnessing a phenomenon called the photovoltaic effect. However, an individual solar cell working on its own only produces a very small amount of electricity, about 4 Watts. This may be just enough electricity to charge your mobile phone. For the technically minded: Each cell produces a high current, about 8 Amps, but a low voltage, 0.5V, to make the 4W of power. To make a solar panel work with some serious grunt, lots of these cells are connected together. 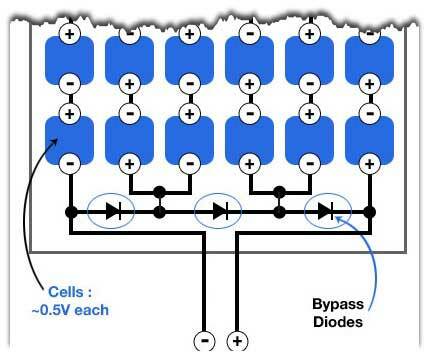 A typical configuration would be 60 cells which would make a solar panel that produces, 60 x 4W = 240W of power. When something is wired in series their voltages add up, but their current stays the same. So in our example, the current output of the solar panel will be 8A, but the voltage will be 60 x 0.5V = 30V. This is all well and good – but there is a problem with wiring all the cells in one long string. Shading. Because the electric current has to travel through every single solar cell, if just one of them is shaded, then the current can’t flow at all. The result is the solar panel efficiency and the resulting electricity output falls to almost zero and. Even a tiny bit of shade can seriously impact how solar panels work. These diodes are like little pressure relief valves. If the current is blocked by a shaded cell, it simply flows through the diode instead – bypassing the shaded cell. If you are interested in how they are wired up to work, here's an example diagram of a solar panel with 3 bypass diodes installed. In this example, a single shaded cell will switch off a third of the panel. Most modern solar panels have at least 3 bypass diodes, which means that a small bit of shade (or bird poo) should only cause you to lose a third of your panel's power. Some of the more expensive solar panel brands, like SunPower, have their own solution to the shading problem which can isolate individual cells, which makes their panels much more tolerant to shade and work better in partial shade conditions. The solar cells are very delicate and need to be protected from the elements. To do this, they are sandwiched between 2 clear polymer sheets that everything in place and then they are sealed onto a glass front plate with another sheet of opaque plastic. Finally, the glass sandwich is put in an aluminium frame to give it strength, and something for the installers to clamp on to. Obviously, most homes are going to need more than 1 solar panel! 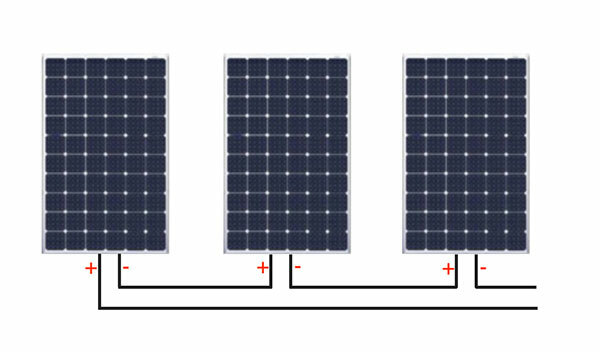 When a goup of modules are connected together in a solar panel installation they become a solar array. 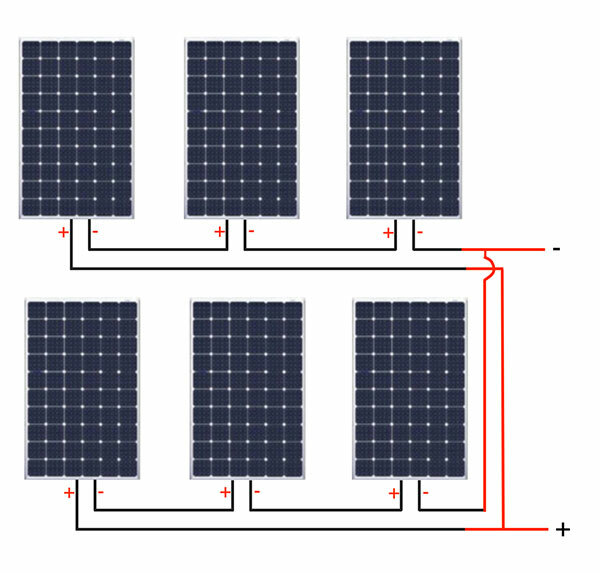 To make up your array, the solar power system designer has 2 methods of connecting them – connecting your solar panels together in series or parallel. If connected in series, the panels’ voltages will add up, but the current will stay the same. How many solar panels should go in series? The designer has to look at the specifications of the inverter to be used and put the correct amount of solar panels in series to get a max and min voltage that the inverter can work with. When deciding how many solar panels to put in series, the designer also need to be mindful of how the ambient temperature affects the voltage out of the panel. Basically the colder a module is, the higher the voltage it produces and vice versa. So your designer should know the hottest and coldest temperature ever recorded in your suburb. The designer also needs to know the temperature specifications of your particular panel model. This information is then used to work out what minimum and maximum voltage is needed from the solar panel string, and therefore how many modules needed to put in series so that your inverter works properly in all conditions. As you can see, the work involved in a solar power system installation is a bit more complicated than just banging the panels on the roof and connecting an inverter. Every system needs to be designed by a qualified designer (not a salesman). And if you want to claim your STC "rebate", you need the designer's signature on the design documents. Never buy a system without getting the signed off design first! When solar panels are put to work in a parallel array, their voltage stays the same, but you add up their current. Once your designer has worked out what string length to be used (i.e. how many solar panels can be placed in series), the designer needs to work out how many of those strings can be placed in parallel to get the desired system size. All strings need to be the same length unless you have a special inverter with multiple inputs. This doesn't always work out nicely. For example, if you are designing a 24 module system, but your maximum string length is 11 panels, then you can only use 22 of the panels (2 strings of 11) or find another inverter. One last check that needs to be made is that the current from this array of solar panels won't exceed your inverter's maximum current. Once that has been verified, you've got an array that should work in conjuction with your inverter to convert the high voltage DC from the panels into 240V AC that can be used in your home. 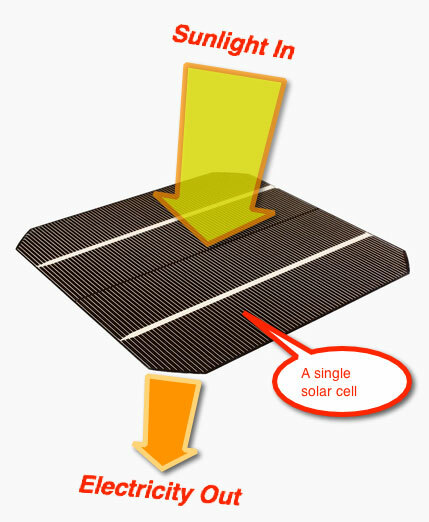 We hope you've found this information on how solar panels work of value. 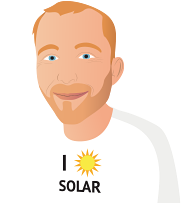 If you're interested in learning more, check out my guide to solar power systems.